Take time to breathe. Take time to create. Take time to reflect, take time to let go. 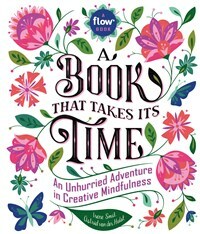 A book that’s unique in the way it mixes reading and doing, A Book That Takes Its Time is like a mindfulness retreat between two covers. Irene Smit and Astrid van der Hulst are the cofounders and creative directors of Flow magazine, a popular international publication packed with paper goodies and beautiful illustrations that celebrates creativity, imperfection, and life's little pleasures. They both live outside Amsterdam. Astrid van der Hulst is the cofounder and creative director of Flow magazine, a popular international publication packed with paper goodies and beautiful illustrations that celebrates creativity, imperfection, and life's little pleasures. She lives outside Amsterdam. The best things happen when you dare to follow your heart. And that’s exactly what we did when we hatched this idea for a new Dutch magazine in an attic room several years ago. We dreamed of a magazine with which we could explore our love of paper. A magazine of unhurried time, all about doing things differently and making new choices. Small happiness, daily life and the beauty of not always managing to be perfect. That is how Flow began. Flow is all about positive psychology, mindfulness, creativity and the beauty of imperfection. We love illustrations and in each issue there is a gift made of our much-loved paper. We print the magazine itself on different types of paper.